Habitat : Wet places in fields in india, korea and japan. Uses : It is good for the hair and skin, expels intestinal worms, cures cough and asthama and strengthens body. 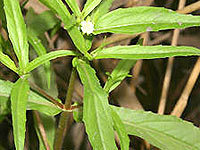 The expressed leaf juice, applied along with honey, is a popular remedy for catarrh in infants. A preparation obtained from the leaf juice boiled with sesame or coconut oil is used for anointing the head to render the hair black and luxuriant. An oil prepared with amla, bhringraj and sometimes with brahmi is well known in India as Amla Bhringraj oil, which is said to blacken the hair. Plant is rubbed on the gums in toothache and applied with a little oil for relieving headache and with sesame oil in elephantiasis. Roots of Eclipta alba are emetic and purgative. It reduce inflammation, obstructive swelling and pain from the liver and blood. They also calm stress and nourish the hair roots. The Bhringraj is a well known hair tonic, helping to stop hair loss. If hair are turning gray prematurely, the color will return to natural.